As the temperature drops and the nights draw in, Silver Bay becomes a haven of winter luxury. Bask in our warm spa, hidden away from the cool evenings in our magnificent pool or jacuzzi, or spend nights curled up with the family in your holiday lodge, heating on, board games out. Whatever your favourite part of winter is, we think everyone can agree that it’s such special time at our Anglesey holiday park with lots of magical family memories just waiting to be made. Already, our Christmas Party is less than a month away. This year, the big night will take place on the 9th of December from 4:40 pm to midnight. 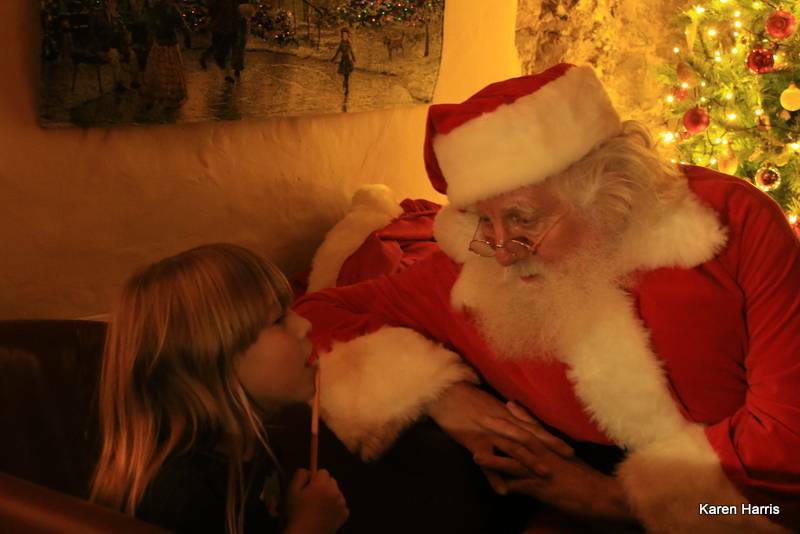 As usual, Father Christmas himself will be stopping by to say hello to all the little ones, and a fantastic festive buffet will provide a place for you to fill your boots with scrumptious grub. There’ll also be face painting, games, and drinks until midnight! Of course, our Christmas party is owners-only, so if you want to book your space, wait no longer! Call us on 01407 860 860 right away. Tickets are £8 per adult and £3 for children. Best of all, under 3’s go free. What would the end of the year be without our fabulous annual New Year’s Eve party at The Deck House? This year, we’re throwing a tribute to the outlandish 80’s! Tickets are also on sale for this fantastic event, and although NYE might come second to Christmas, we recommend you don’t hang around. There’ll be glitz, glamour, dancing, drinks and food – what’s not to love? Bring in the near year in style amongst friends and family! The festive time of year provides the perfect chance to treat yourself or someone you care about to a treatment or product from our luxurious spa. As usual, we have a fantastic monthly offer for you to make the most of. Our December Treatment of the Month is the wonderful ELEMIS Couture Touch Face & Body Treatment for 60-minutes. Reduced to £40 from £60. 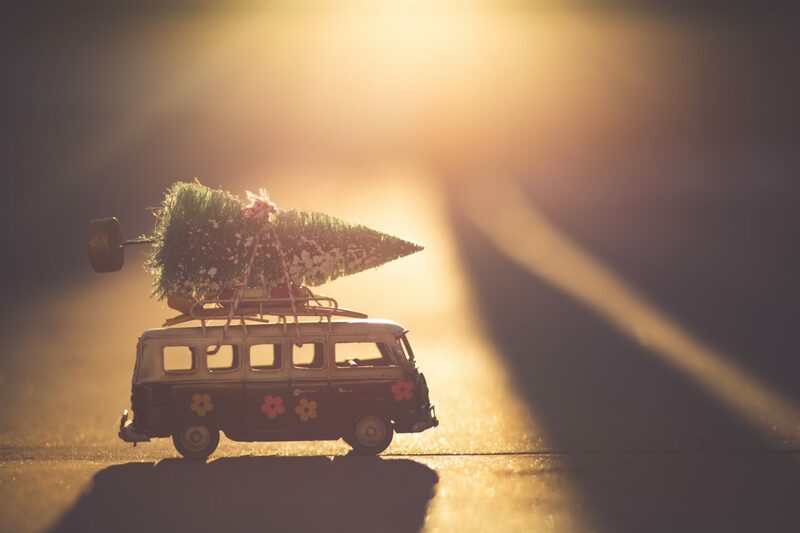 Forget about the hectic Christmas shops and take a much-deserved break with us! Our product of the month this December is perfect for that irksome winter skin. Welcome the ELEMIS Skin Buff for just £20, reduced from £28.50 – On a side note, this product also makes an excellent Christmas present! Christmas at Silver Bay wouldn’t be complete without our activities. Of course, there’ll be festive sessions galore – including Christmas Decorations and Christmas Crafts that everyone will love. Supervised Gym and Supervised Activities will be back at the spa if your health and fitness regime is on the agenda, as will the ever-popular adult-only swim. For the full newsletter please take a look below. As current owners know, we close the village down at the beginning of the new year. We’ll be closed between the 4th of January – 12 of February, and should you need us in the meantime, our reception team will still be on hand 7-days a week between 9am and 3pm. Finally, we’d just like to take the chance to wish everyone a fantastic Christmas and all the best for the new year! 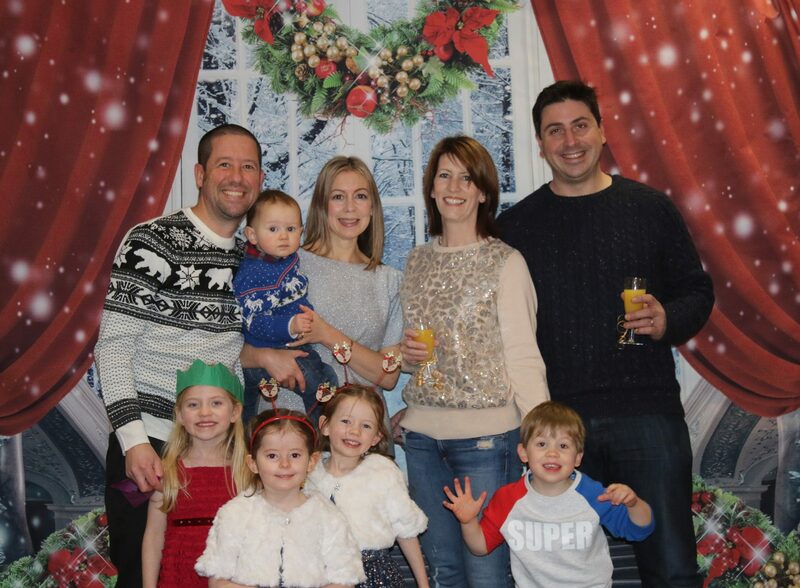 Glitz, Glamour, And Razzmatazz – The Silver Bay New Year’s Eve Party Had It All! On the 31st of December, The Deck House was transformed into a glamorous speakeasy, brimming with alluring 1920s chic ready to bring in the new year! 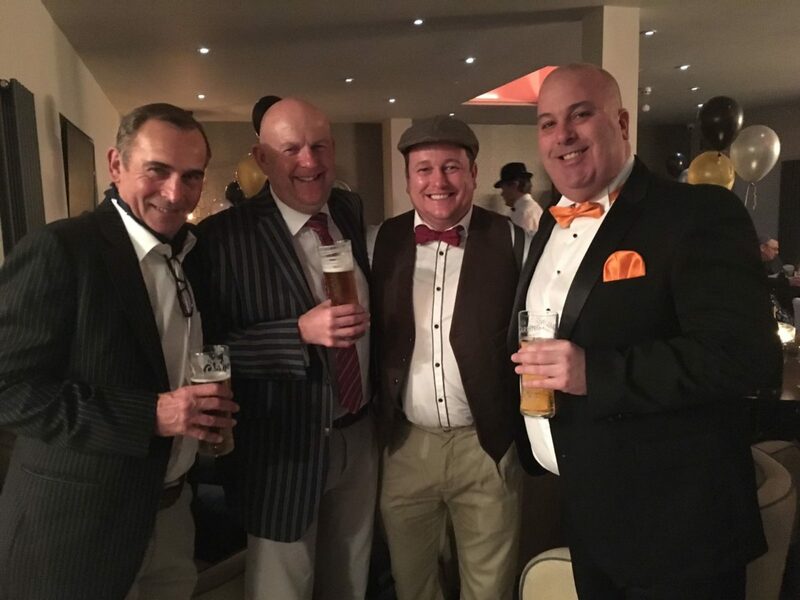 It was a lively night full of excitement and celebration, the atmosphere was electric – as was the fancy dress effort from every single lodge-owner here at Silver Bay Holiday Village. The party was kicked off by a stand-out clown who awed and inspired children and adults alike with his magic – he even had a live, fluffy rabbit with him (much to the delight of our party goers)! After that, dinner was served and featured a range of delectable treats prepared by our amazing chefs, and once stomachs were full, The Runaway Babies made their much-anticipated return and took to The Deck House stage. The last evening of 2016 was danced away and the new year was welcomed in with warmth and cheer – setting the tone for what will be a wonderful year here at Silver Bay Holiday Village. It was a delight to host such a great night had by all, and we can’t wait to do it again with our annual summer party later on this year! Below you’ll find a video of the evening’s antics. Why not see if you and your loved ones made it below? There were some fantastic costumes on the night that deserve to be appreciated time and time again. 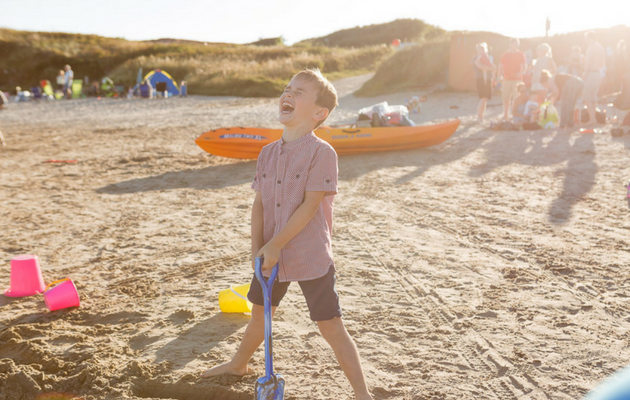 If you’d like to find out more about life at Silver Bay Holiday Village and how you could become the owner of your very own haven on Anglesey, call Jamie Hughes, General Manager, today on 01407 860 860. You can also view our free eBrochure here. Each culture has different Christmas traditions, it’s part of what makes the festive time of year so rich in diversity and so full of wonder. And just like there are particular traditions practiced in Ireland, England and Scotland – there are also some Welsh Christmas traditions that people should enjoy! If you’re planning on celebrating the festive period on Anglesey this season, then we suggest you take a little look below and integrate some Welsh practices into your Christmas celebrations. They’ll certainly add a new, yet old, spin on the most magical time of year! What would Christmas be without carols? Well, in Wales caroling is traditionally a little different. Taking place early Christmas morning, between 3am and 6am, to be precise, people would gather in local churches and sing their hearts out during the 19th century. They usually stayed awake throughout the night ready for the early morning carols – and although we think the tiredness may have put a bit of a damper on Christmas day itself, why not have a little sing song with the family before bed this year? Plygain also still occasionally happens, meaning that if you really want to take part this year you can! Churches famed for it include St David’s Bishop’s Palace, so be sure to seek out those in your local area for something a bit different. We all love a few extra sweet treats during Christmas time, and so to do our friends in Wales. In fact, they often made toffee an integral part of their celebrations in years gone by. On Toffee Evening, also known as Noson Gyfraith, friends and families would get together at one another’s houses and play games, have food, tell stories and make toffee over the fire. It was popular during the late 19th century, so why not have a go at making your own this Christmas? It’ll certainly invite a little bit of Welsh festive charm into your lodge. You can also nip to the supermarket and pick some up if you want to take a little shortcut. We promise we won’t tell anyone! In Wales, the Halloween tradition of Trick or Treating was actually something that happened during the festive period. On New Year’s Day, between dawn and noon, children would go from door to door with good wishes for the new year, and in some cases, they would sing and splash people with water. They would then be given a gift for their troubles, usually loose change. We don’t recommend your children continue this tradition in 2017 as it hasn’t been practiced since the early 19th century – but it might be nice to wish each other well and buy gifts for New Year’s Day. We can’t think of a lovelier start to the new year. Not all Welsh Christmas traditions are particularly pleasant, and one of the less favourable festive customs lies within ‘holming.’ This tradition also took place during the early 19th century, and you wouldn’t have wanted to be the last one to get out of bed on Boxing Day! If you were, you would be beaten with prickly holly sprigs. As you can imagine, this is something that is certainly not practiced any longer. But if you want to make fun of the last person out of bed on boxing day, we recommend a friendly little hair-ruffle. Perhaps even a snuggly hug! There are four staples of a modern-day New Year’s Eve. Family, friends, food, and last but not least, something to whet your whistle! And as you can imagine, there also used to be a traditional Welsh drink created at NYE that people enjoyed. This tradition actually has roots back to Tudor customs, where people drank from patterned Wassail bowls. They’d be full to the top with tasty sugar, fruit, spices and warm beer. Yum! Why not try making your own version for New Year’s Eve? Everyone loves a good punch, and it’s a great way to toast 2017 with those you care about. If you fancy spending Christmas and NYE in your very own holiday home, then why not get in touch with Silver Bay Holiday Village today? We’re also hosting our annual Christmas and NYE’s parties too, exclusively for lodge owners, and we’d love to have you along. Take a look at our free eBrochure here or call our General Manager Jamie on 01407 860 111 to find out more. You can also take a look at our blog from Sian Ediss, who recently visited our site for a taster weekend! 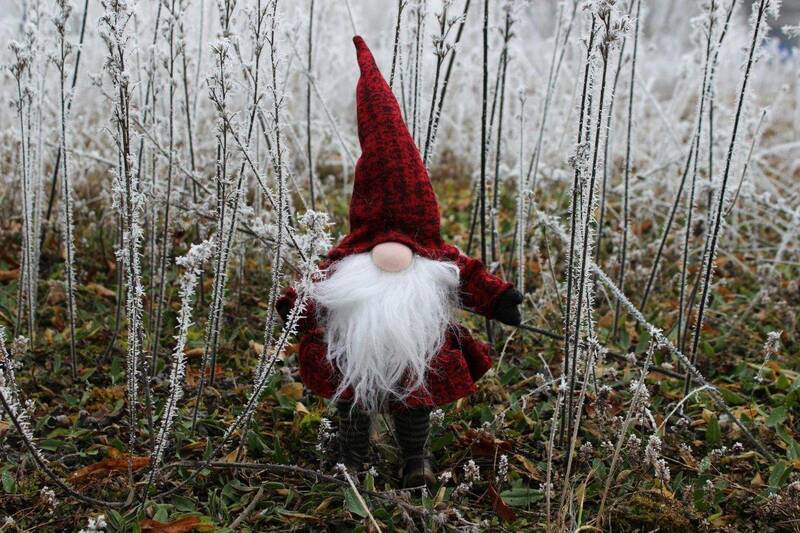 It’s Time To Think Festive! Our 2016 Christmas and NYE Planners Are Here! 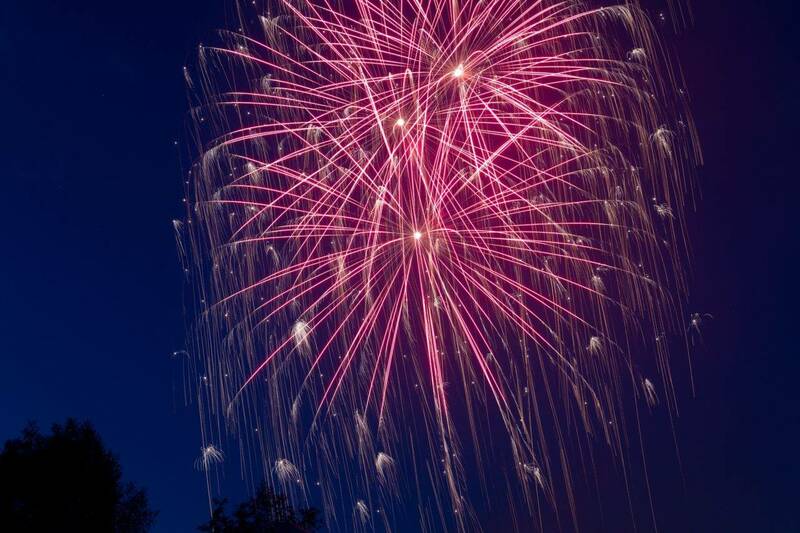 As we wave a fond farewell to Halloween and Bonfire Night, it’s time to look towards the end of the year. A joyous Christmas and New Year’s Eve are on the cards here at Silver Bay, and we’ll be hosting our annual Christmas party and NYE celebrations as well as a range of other festive events to get the Christmas spirit flowing! Below you’ll find all the exciting details of everything that’ll be happening at our luxury holiday park during the final few months of 2016. You’ll be full to the brim with festive excitement by the end! We have two big weekends during November and December that will sate your appetite for partying and magical Christmas fun! Our highly anticipated annual Christmas Party will be held from 6:30 pm until midnight on the 26th of November. 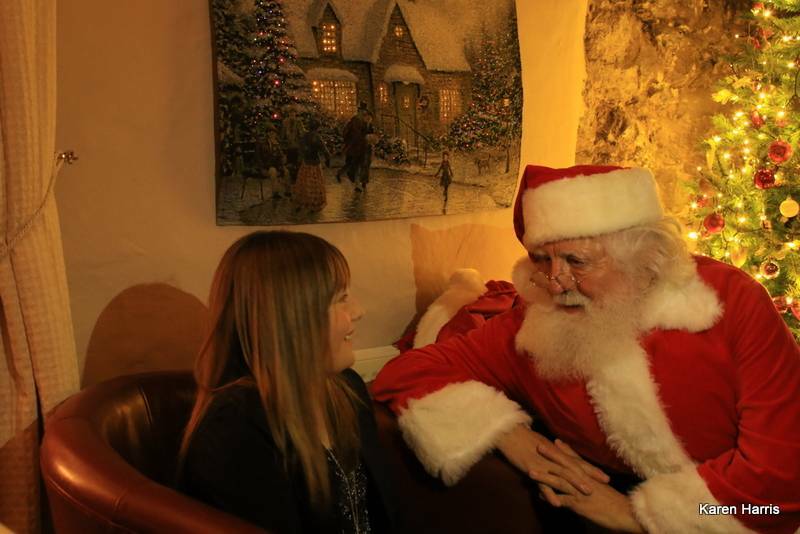 There’ll be a special, festive, VIP visiting us (we hope your little ones have behaved themselves this year!) and everyone will have the opportunity to have a photo take with our guest! We’ll also be hosting a festive disco for the children from 6:30 pm to 9:30 pm, and then the adult disco will kick in. But the fun doesn’t stop with dancing. 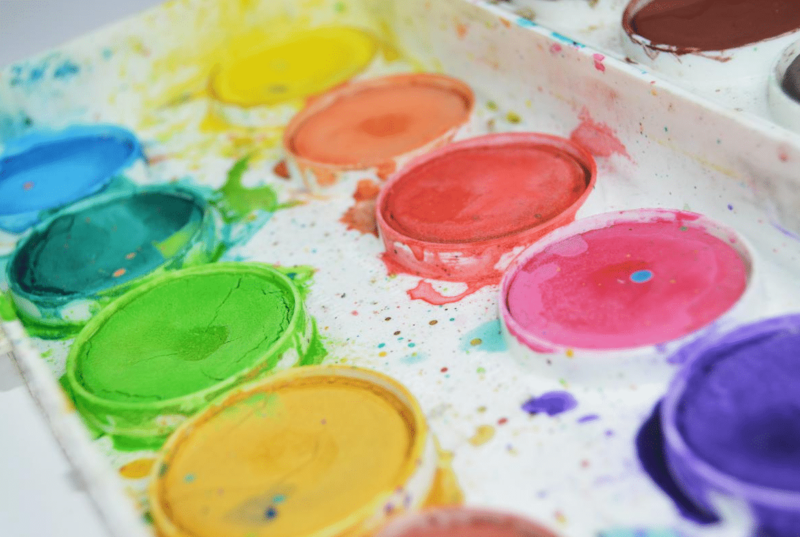 There’ll also be some exciting games and face painting to keep the children entertained, as well as plenty of prizes to be won for both adults and children alike. We’ll also have a scrumptious buffet on offer from 7:30 pm with lots of wintery treats and festive warmers for all ages – be sure to look out for Charlotte’s spiced mulled wine, too! Tickets are required for the Christmas event, so please call reception on 01407 860 860 to avoid disappointment. Prices are £8 per adult and £6 per child. Under 3s go free. Our second big weekend will be held between the 30th and the 31st of December. Once more, the Silver Bay community will come together and celebrate NYE 2016 in style with a glamorous Great Gatsby themed party! The evening will feature an indulgent 1920’s menu created by our fantastic chefs, as well as the return of the popular cover band The Runaway Babies. Tickets are available from the 15th of November and will be £25 per adult and £10 per child. Under 3s also go free. And remember… the fun doesn’t stop with our parties for lodge owners. We also have a range of activities running from Water Polo to Adult-Only Swims during the aforementioned weekends. Take a look below for the precise dates and times these activities will be taking place. 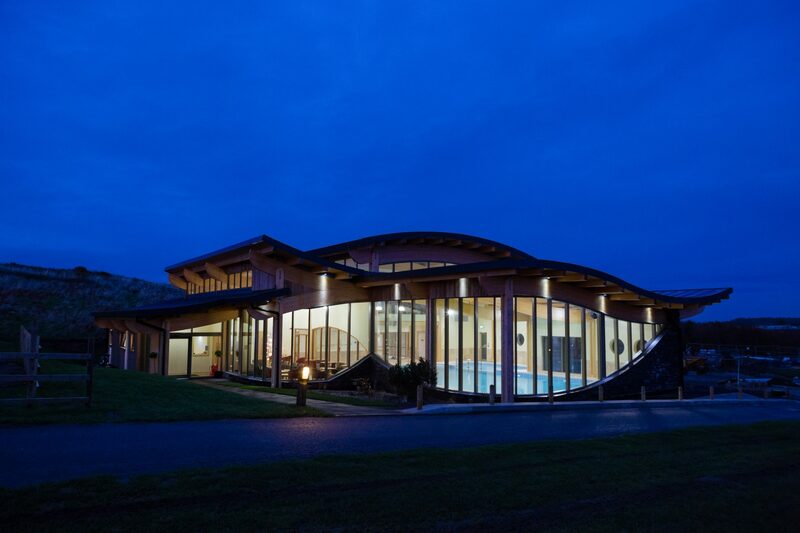 Furthermore, we’re excited to announce that there’ll be a range of brilliant special offers available at the Spa at Silver Bay, offering the perfect opportunity to relax and recharge those batteries before the party season gets in full swing! Finally, there will also be a few changes to our opening times across November and December. Take a look below to ensure your stay over the Christmas period is planned to perfection for a flawless Christmas and New Year break. 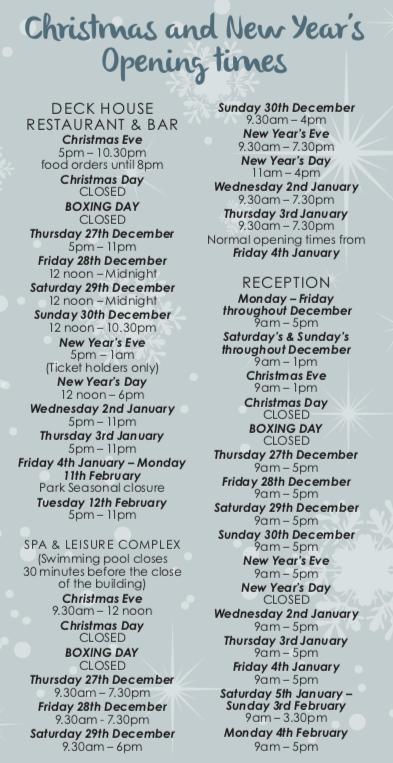 If you have any questions or queries about our Christmas and NYE events, be sure to call us on 01407 860 860. 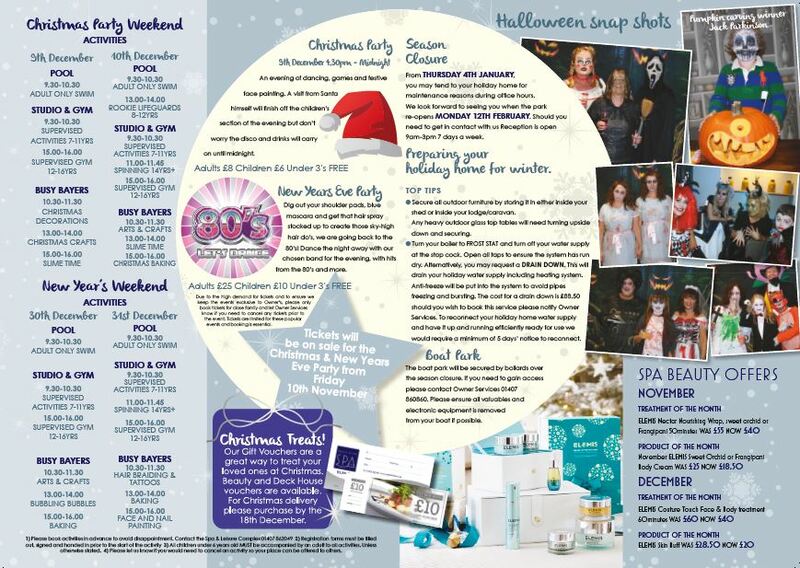 We’re also hosting a tremendous Christmas Beauty Event on Friday the 18th of November at The Spa at Silver Bay. Take a look here to find out more and book tickets.